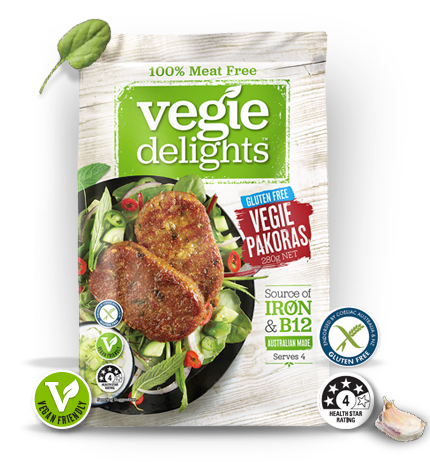 Our Australian-made gluten-free Vegie Pakoras are perfect for vegan curries, snacking with dips and in wraps. Oven: Cook from frozen for 15-18 mins in a pre-heated fan-forced oven at 180°C, turning once mid-way through. BBQ or Pan Fry: Cook from frozen in a pan or on the BBQ plate with a little cooking oil for 7-10 mins. Turn to cook both sides. Made in Australia from at least 73% Australian ingredients.